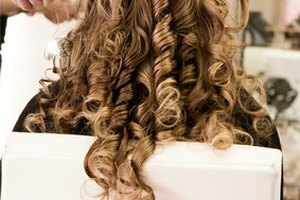 Sleeping with your hair in curlers can save you time when attempting to add curls to your hairstyle. Instead of needing to wake up earlier than normal, you can simply set your hair in the curlers and lie down for the night. 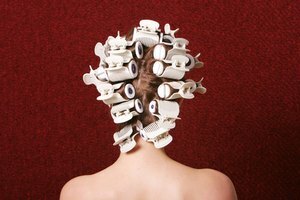 Without taking the proper steps, however, sleeping in hair curlers can be quite an uncomfortable experience. Avoid discomfort and achieve the desired look with some preparation by following these five steps. 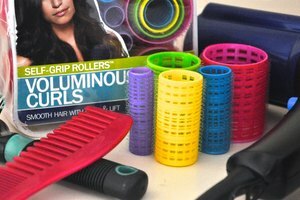 Set your hair in the curlers as you normally would. When you do this, your hair should be damp but not soaking wet. If your hair is soaking wet, it will not set completely. Place a plastic hair shower cap on over the curlers. This will help to seal in the moisture after you set your damp hair in the curlers. Wrap a bandana or similar-sized cloth around the shower cap. The cloth will be the most comfortable if you wrap it around the back of your head first and then tie the corners together near your forehead. Use hair curl clips to secure the bandana or cloth around your hairline. You should only need about two to four curl clips to secure the cloth. How you position the cloth will vary based upon how your head typically rests on your pillow. 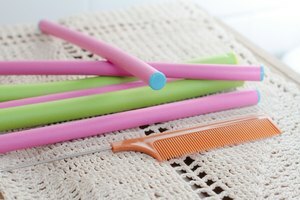 Bobby pins can be used as a replacement for the hair curl clips, but they may not be as secure. Lie down in bed and rest your head on your pillow. Reposition any hair curl clips or pins, or the knot you tied in the cloth if you feel any discomfort.